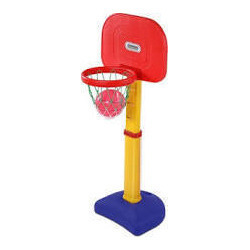 - Size: L15" x W20" x H54"
We provide a wide range of kids’ essentials such as ADJ Basketball Set. This set is easily available to clients at extremely reasonable market prices. This set can be installed conveniently. 3.2 mtr extension. 30 mm Acrylic Board 3 spring dunking ring. Height adjustable to 10ft, 9ft and 8ft. 3 spring dunking ring. Three side padding. Powder quoted paint. We are manufacturing and supplying best quality Basketball Set in Bengaluru, Karnataka, India. These are made using best quality virgin materials which are sourced from reliable vendors of the industry. Available in diverse sizes that match the requirements of our customers. Rectangular polypropylene backboard 112 x 72 cm. - R‘m adjusts rim height in 6in (15.2 cm) increments from 3oin (76.2 cm) to48 i1(121.9crn). 45 cm. powder coated ring. Round fixed post 120 cm. extension arm. A sturdy Basketball Set for children of different age groups with a hoop that can be adjusted to 5 different heights from 4 to 6 feet. It includes a breakaway rim an 1 junior sized--soft-basketball that ensure safe playtime for your little ones. See tomorrows basketball star learn the basics today!